Good morning! We have a guest blogger on The Worktop today! Maya from Treats and Eats is sharing a bit about mornings on her worktop. 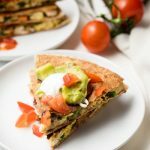 She’s sharing her recipe for Individual Breakfast Pizzas! I host guest posts to introduce you to other food bloggers that I enjoy following. 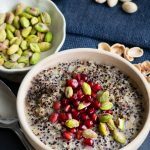 I invite them to answer a few short questions and to share one of their delicious breakfast dishes. 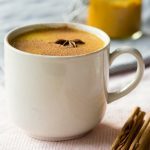 Maya has a fun blog filled with a range of delicious foods. You can find everything from baked goods, cocktails, and comfort foods. 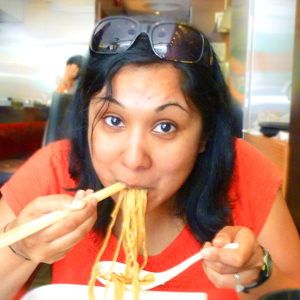 She’ll try (almost) anything once, but she’d be happy to live off of cheese, chocolate, sushi, and noodles (just look at her profile picture and you’ll see her love for noodles!). 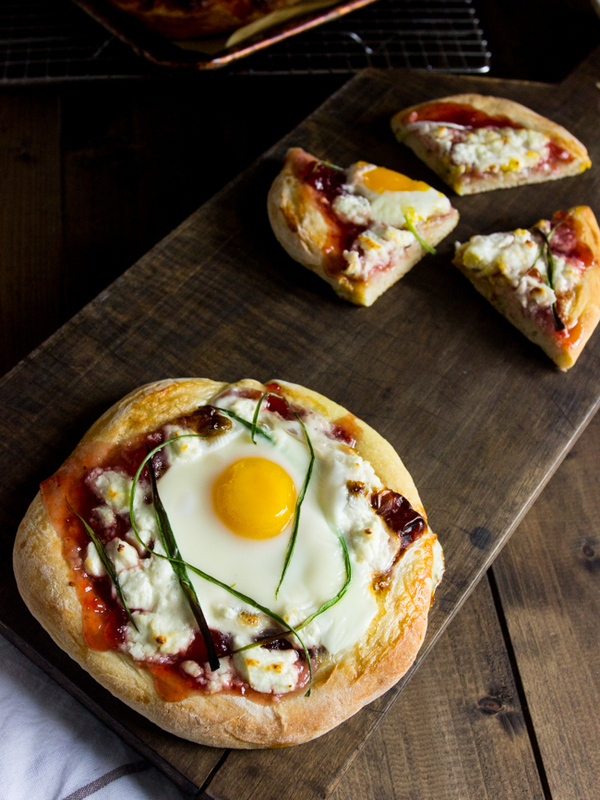 So read on, go ahead and meet Maya, and get ready to salivate at her individual breakfast pizzas. Sure! My blog comes out of my firm belief in the joy of treating yourself to small indulgences. 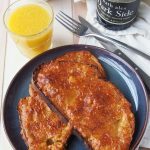 I usually focus on cocktail recipes, desserts, and comfort foods. But really, I love bold flavors, flavor mash-ups, and any food or drink item that just feels special and celebratory. For cocktail inspiration: Death to Sour Mix. For baking inspiration: Bakers Royale. For flavor inspiration: i am a food blog. It depends! Before breakfast on weekdays because I take my breakfast to work and eat it there. But on weekends I usually eat before brushing my teeth. Over easy, poached, scrambled, hard boiled, soft boiled- pretty much anything except omelettes for some reason! 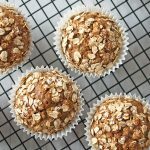 Oatmeal: what do you put on it? Always: peanut butter, cinnamon, and milk. Sometimes: a banana. Hmm. Tough call but donuts probably win. Especially if they’re fancy gourmet donuts. Another tough call! My usual routine is oatmeal or a smoothie on weekdays and eggs and toast on weekends. But my favorite guilty pleasure to order when I’m out is probably nutella stuffed french toast with a side of bacon. But now I’m realizing I haven’t had that in years! What does Murray eat for breakfast? Love this question! Murray would eat pretty much anything. But he’s pretty much stuck eating his lamb and apple kibble. But sometimes he gets a spoon of plain yogurt on top for a treat. He LOVES yogurt! I’d love to! 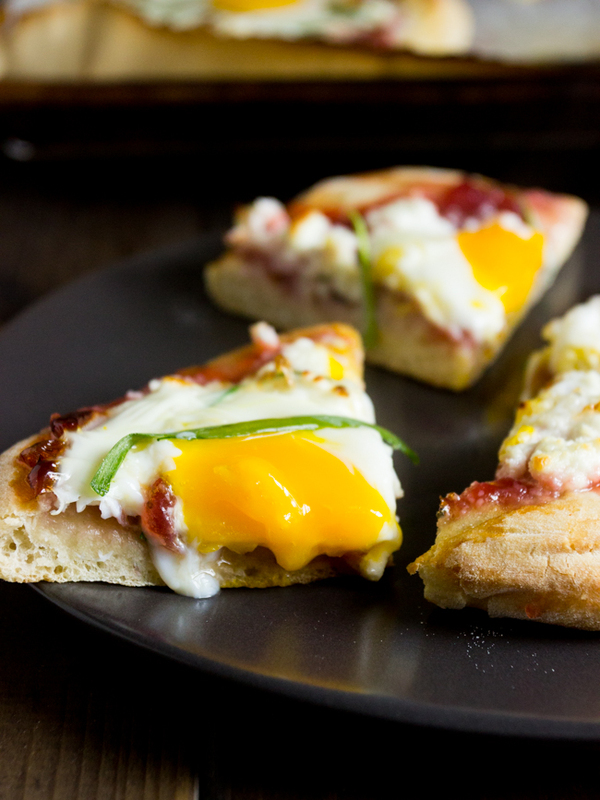 I love these sweet and savory individual breakfast pizzas. 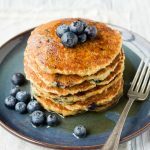 These are great to make for a brunch or even just for yourself. 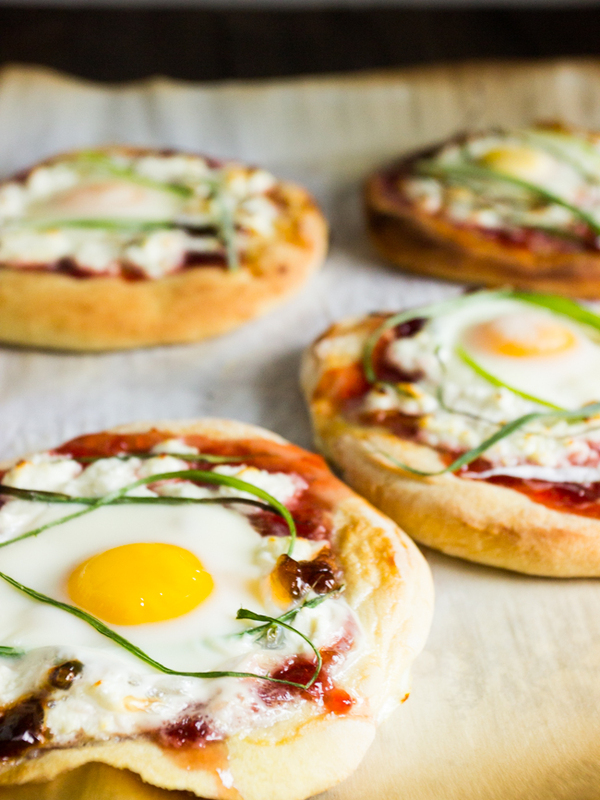 Start the day with breakfast pizzas! You can make your own dough using the recipe below, or use store bought pizza dough. Place oven rack in the upper third of the oven and preheat to 500°F/260°C. Add water to the bowl of a standing mixer and sprinkle yeast over the top. Let sit for 10 minutes. At this point the yeast should be frothy, if it's not, it's likely your yeast has gone bad and you should start again with a new package. Add 1 3/4 cup flour, salt, and olive oil to the yeast mixture and stir with a spatula until well combined. Place the dough hook on your standing mixer and run for 5-6 minutes, or until the dough is smooth but slightly sticky. If it's too sticky you can add a couple tablespoons of additional flour as it's kneading. Dump the dough onto a well floured surface (I use a large cutting board) and shape into a ball. Cut the dough into 4 equal sized pieces, dust the top of each ball with flour, and cover with a floured piece of plastic wrap. Make sure you have allowed for enough space for each piece to rise. Place in a warm room and let rise until doubled, about an hour to an hour and a half. Once the dough has doubled you're ready to make your pizza. Cover a large baking sheet with a sheet of parchment. Flour your hands and then stretch each ball into a 5 inch round, carefully placing each round on the parchment covered baking sheet. Spread 1 to 1 1/2 tablespoons of the jelly/jam on each pizza, leaving a half inch border around the edge. 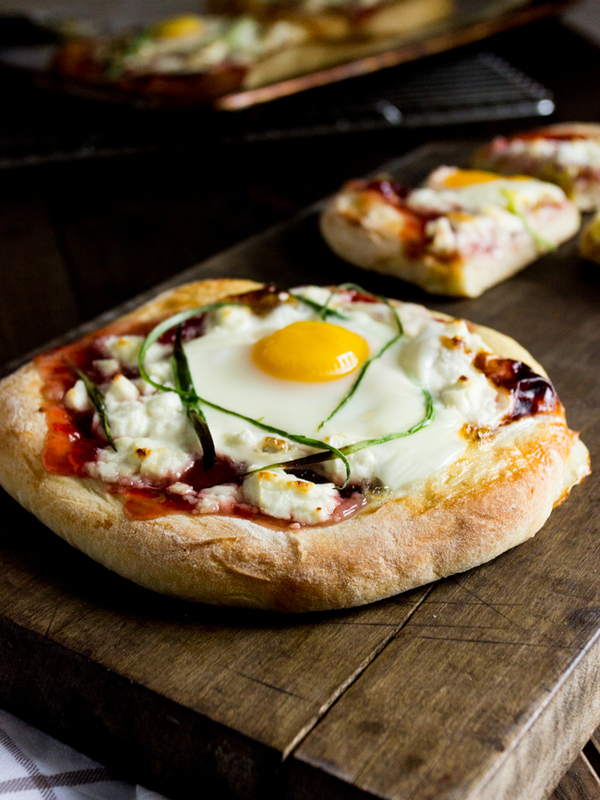 Crumble the goat cheese and top each pizza with 1 oz of cheese, leaving a gap in the middle for the egg. Crack one egg into a small bowl and carefully tilt the egg from the bowl to the center of one of the pizzas. Repeat for the remaining three eggs and pizzas. Sprinkle about half of the scallions over the four pizzas. Carefully place the baking sheet into the oven and set the time for 8 minutes. After 8 minutes you should monitor your pizza and cook until the egg is cooked to your liking. I like my eggs a little runny, so I cook my breakfast pizzas for exactly 12 minutes. Remove baking sheet from oven and top with additional scallions. You can season with some salt and pepper if you'd like. Let cool for a few minutes and then enjoy! Tip: For a nice browned crust, brush the edges of the crust with olive oil before baking. Crust recipe is adapted from Gourmet . Oh I adore Maya and her blog :) Thank you Tina for featuring a fabulous blogger on your fabulous site! Smart, strong women must stick together… and provide the world (<—- mostly me, i'm selfish) with drool worthy pictures and stellar recipes. 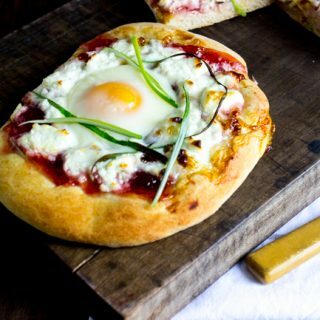 This breakfast pizza looks and sounds delish! :) Cheers and thanks for sharing a great Q & A and a great recipe! 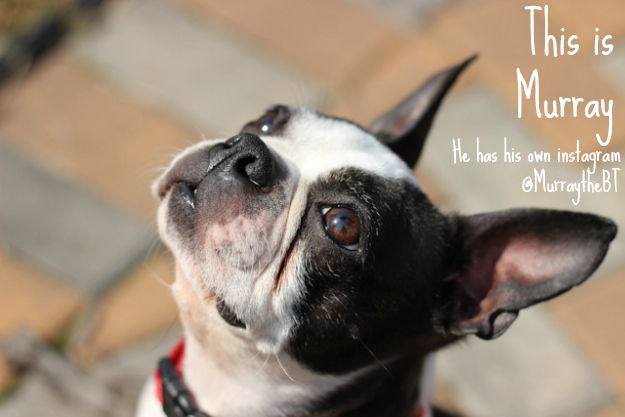 Yes, I definitely agree that Maya has an incredible blog! I love popping by her site and seeing all her neat new creations. Glad you enjoy reading the guest posts. Hi Maya!! Wow, I love this, what an awesome way to meet new bloggers! Goooooooooood morning! It looks like it is a super yummy and powerful breakfast! I never had a pizza for my breakfast, but why not!? Even your dog wants to have a piece :). Just found you on FoodGawker! I absolutely LOVE this idea. Definitely going to be trying these, and I love how you interview your guest posters! So personal! Yes, Maya shared an awesome recipe! Using jam is just brilliant!